Families suffer tremendously when a parent is diagnosed with a debilitating or terminal illness. In addition to the trauma and anxiety that such a diagnosis produces, the family’s sense of stability and normalcy is thrown into chaos, especially for the children. Their normal home life is disrupted by numerous doctor’s appointments, a loss of income, and the caretaking abilities of the sick parent are often severely limited. Parents want to ensure their children receive the attention, love, and support they need to cope with such a situation, but they often don’t have the emotional and physical resources to do so. That is where we come in. At Chai4Ever, we strive to alleviate some of the stress and hardship that families endure when a parent falls ill with care and support services that can sustain them through this difficult experience. Our goal at Chai4Ever is to lighten the impact of parental illness for the patient, the spouse, and the children by providing practical and emotional support for the whole family. We strive to create a caring community that surrounds the family in crisis with strength and hope and which helps keep their home life stable and functional, so the children can thrive and the parent can heal. Some of our many support services include homemade meal delivery, transportation to and from medical appointments, homework help for children, housekeeping assistance, medical insurance advocacy, crisis counseling, caregiver support for the healthy spouse, and so much more. Our family retreats give patients and their families a chance for a stress-free weekend away to recharge and reconnect, and we collaborate with the children’s schools to ensure the children receive the extra support they need to maintain their grades. We have organized numerous recreational events for children with sick parents, such as carnivals, concerts, parties at indoor recreation centers, and even a travel camp in Israel for more than 200 children. We help families in crisis all over the United States as well as in Israel, and as of 2016, we have provided hands-on support to over 500 families. We enlist the help of local volunteers and seek out local resources to provide the maximum level of support for families available. We hope to continue our mission and expand our reach to provide hope and strength to many more families in crisis in the years to come. Your support enables us to fulfill our mission to help these families in crisis, and is much needed and greatly appreciated. Our donors even have the opportunity to specify what their gift will sponsor. You can choose to send holiday gifts to the children of a sick parent, sponsor a week of housekeeping for a family in need, or even send a child to summer camp for a much-needed reprieve from the heaviness of life with an ill parent. 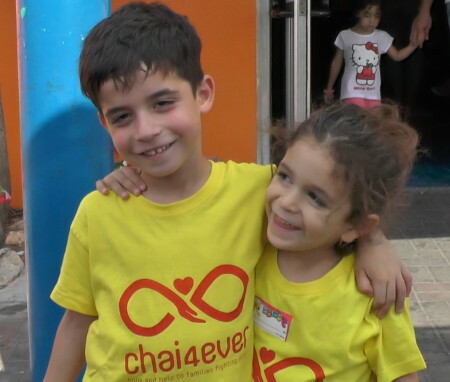 Make a one-time or recurring donation to Chai4Ever, and give the gift of stability and normalcy to children and families in need today.